Palmdale Mayor Jim Ledford, right, presents Deputy Eduardo Saucedo, center, with a plaque. Palmdale Sheriff's Lt. Don Ford looks on. PALMDALE – Deputy Eduardo G. Saucedo received a standing ovation from all in attendance at the Palmdale City Council meeting Wednesday when he was presented with the annual DUI plaque for obtaining the highest number of DUI arrests at the Palmdale Station in 2011. But Saucedo was not able to stand himself. He accepted his award in a wheelchair. Saucedo was hospitalized on Nov. 12, 2011 after a DUI driver ran a stop sign and broadsided the parked sheriff’s patrol car Saucedo was sitting in. Read more on that here. This caused Saucedo to miss several weeks of work as he recovered from his injuries. Still, Saucedo made 122 DUI arrests in 2011 to achieve the annual DUI plaque for the fourth year in a row. Saucedo made 98 DUI arrests in 2008; 184 in 2009; and 136 in 2010. In four years, Saucedo made a total of 540 DUI arrests, according to statistics provided by the City of Palmdale. 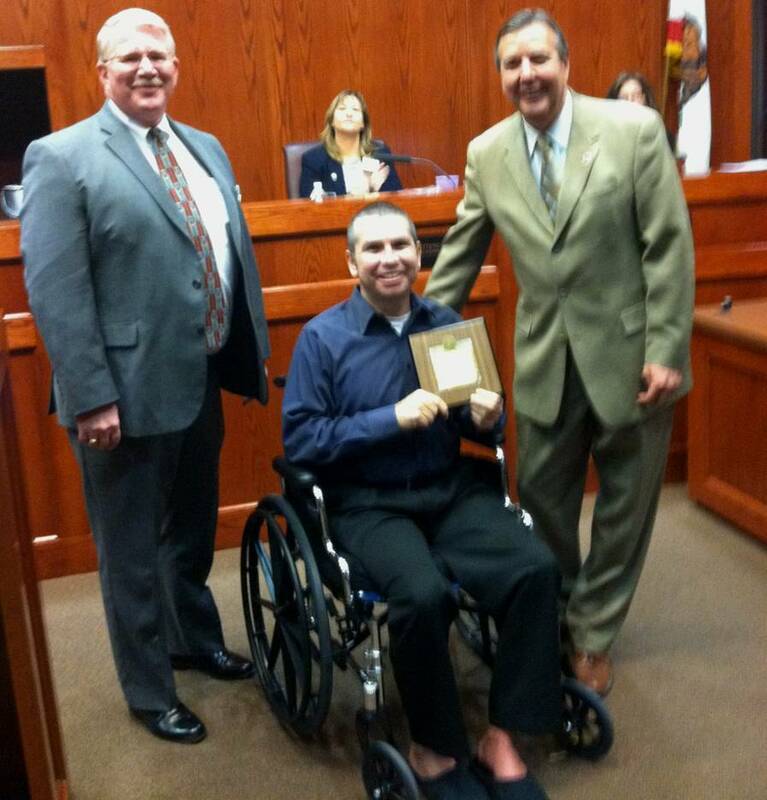 In accepting his DUI plaque, Saucedo said he was ready to get back to work. “I am hoping that I go through a speedy recovery so I can get back to work and keep the streets of Palmdale safe for everybody out here,” Saucedo said. According to the National Highway Traffic Safety Administration (NHTSA), alcohol-related fatalities totaled 11,773, which represents 31.7 percent of all fatal crashes. Those fatalities represent an average of one alcohol-related fatality every 40 minutes. About one in every ten Americans will be involved in an alcohol-related crash sometime in their lives. For more information, contact Lt. Don Ford at the Palmdale Sheriff’s station at 661-272-2400. 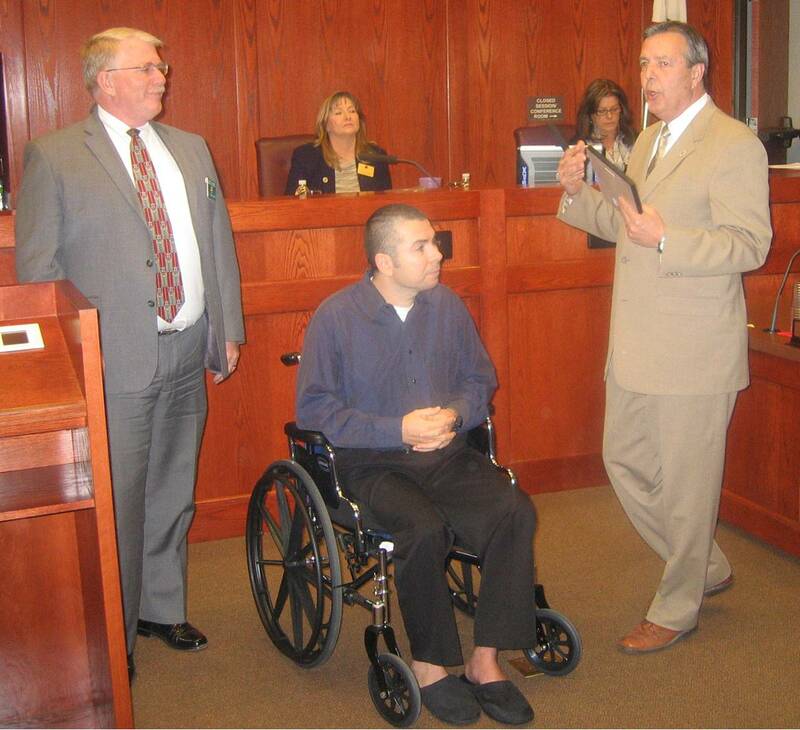 5 comments for "Making a difference: Deputy honored for most DUI arrests in 2011"
Keep up the good work brother. The whole family is proud of you. Get well soon. Hi Eddie! hope you get better soon!! and Congratulations! Maria Moran you know me by Maria Tapia! hope u get better soon!!! Take care of yourself so u can continue to keep our streets safe. Congratulations and THANK YOU Deputy Saudedo. I hope your recovery is swift so may may get back to doing what you do best.